Art de Vivre presents the grandest country homes and estates for rental in Britain, in our brand new British Country Estates Collection. As a British company, we are extremely proud to be representing these prestigious properties that demonstrate the best of heritage, culture and hospitality in the British Isles. The vast selection of unique experiences available at these estates provide long-lasting memories at these fantastic historical locations. The British countryside is famed for its balance of wilderness and maintained land. Often a focus of historical literature, the backdrop of these estates features maintained private land with expansive rural views. Clearly these private lands are perfect for walks and the local landmarks and peaks are ideal for a more adventurous hike. Corrour Lodge is a modern Scottish revival of a Victorian hunting lodge with the peaks and Loch Ossian nearby making it best suited for guests who love the outdoors. Traditional rural sports and game hunting is a unique offering at these private estates, whether it be the well sought-after Salmon fishing at Gordon Castle, deer stalking at Aldourie Castle or game shooting at historical estates such as Althorp House. With award-winning shoots and fishing stays, our properties exhibit the best and most traditional backdrops for these distinctive experiences. Country homes with their vast capacity and hospitality are often used for celebrations. These homes make the perfect venue for banquets, balls, weddings, product launches and parties. The restored estates with a more opulent and modern approach tend to host the most special events. Aynhoe Park on the edge of the Cotswolds provides an ideal setting for events with its hybrid of modern art collections and taxidermy with the historical house and furnishings. Scotch whisky is world renown and the whisky experiences offered in our new Country Homes collection explores the pinnacle of quality whisky. Enjoy a personal guided whisky tour through the lesser-known whisky distilleries of Scotland. Gordon Castle is a short trip from the Speyside distilleries and lesser-known single grain distilleries. Plenty of outdoor competitive sports are on offer in the expanse of these estates and iconic sporting arenas are within a short drive from many of the country estates. Candacraig is nearby Royal Aberdeen, Fraserburgh and Trump International golf courses ranked among some of the best golf courses in Scotland. Many other sports are available on the grounds of the estates, such as cricket and local teams can be called on for spectator sports or the grounds can be used for a private game. For those interested in motorsports, Goodwood estate is host of the festival of speed and features their legendary motor racing circuit. Ultimately the heritage of these properties adds the most prestige. The experience of a private estate that’s retained its history and cultural collections is an important part of the country homes experience. Whether it be the hundreds of artworks and paintings of gentry, nobility and monarchs or the personal furnishings of a proud British dynasty. The restoration and maintenance of these extraordinary homes coupled with the generous hospitality grants that your stay is the very best of British heritage. Our British Country Estates Collection are perfect for events or quiet retreats with traditional experiences. Most of these properties are known for their vast historical heritage, household staff providing the best service in the world and the authentic and unique British experience. We look forward to arranging your country estate stay, please do get in touch. One17 is an architectural practice that produces a fantastic quarterly cultural magazine for its high-net-worth clients. The publication is called 'One17 Notes' and we are proud to have been featured in their latest issue. Kevin Drayton, the magazine founder and One17 partner, was intrigued by our company and story and decided to run a 4-page interview with our founder, Julie Gauthier. The extensive interview goes into plenty of detail on our team, process and ethos too. The interview is accompanied by some stunning high-definition images of our properties and, as soon as we saw the printed copy at last week's’ cocktail party, we were excited to post it online. Here are links to two documents, one features just our article, for those who want to read it for themselves and the other features the whole magazine by One17 for anyone who wants to read the rest of their fantastic fourth issue. With the introduction of our new services in yacht and private jet charters this past year and after the success of the London Boat Show, we looked forward to the London Yacht, Jet & Prestige Car Show this week. The trade show presents a range of luxury transport products and solutions in Old Billingsgate, a prestigious Thames-side exhibition venue. Sun greeted our team as we made our way to the show on its opening day. This year the show exhibited plenty of modern concepts such as drone videography, digital travel chartering solutions and philanthropy consultants. The stars of the show was naturally the vast array of glossy sports cars and boat engines. The Luxury Network, which Art de Vivre is a member of, hosts a cocktail party annually at the show and we co-sponsored this years event. With our new show banner displaying the variety and quality of the properties in our collection, we set up near the centre stage for the upcoming party. Gordon Castle, a beautiful Scottish property in our debuting British country homes collection, kindly provided a luxury prize for the evening; a beautiful luxury hamper. The Gordon Castle Walled Garden hamper contained their new range of products from the Gordon Castle estate including a bottle of award-winning Gordon Castle gin and from the Herb Garden and Orangery, a salt scrub, shampoo, candle and luxury hand soap. When the prize giving came around, team member, Sacha quickly entered at the last moment and won Linn’s prize of 6 months of Tidal membership. Kevin Drayton from One17 won our Gordon Castle luxury hamper prize; the lifestyle publication that accompanies their architectural practice recently published a Q&A with our founder, Julie Gauthier. The night was a great success for introducing ourselves to new potential clients and other luxury brands and services. The canapés from Stock and Bailey Catering and the beautiful Vodka cocktails, courtesy of Wild Knight Vodka, were delicious and ensured everyone was in high spirits all evening. A great event with plenty of friendly faces and good weather, we couldn't have asked for more. Art de Vivre was proud to sponsor the cocktail party and looks forward to future events with like-minded brands and services. The London Yacht, Jet and Prestige Car Show is still ongoing and the weather for this week is stunning, so we encourage you to give it a visit. Art de Vivre is proud to announce an expansion of its luxury travel services to include the finest yacht charters across the globe. We have partnered with TJB Super Yachts to provide our clients with access to over 2,000+ possible yacht charters. Combining our already established prestigious villa and chalet rentals worldwide with a luxury yacht charter, our clients will have a more complete and unique experience than ever before. Art de Vivre is proud to announce its new luxury Private Island Collection. These islands feature exclusive-use rentals, often with their own endemic ecosystem and unique experiences for their prestigious guests. These island paradises are an unrivalled luxury escape for the adventurous traveller. As one of the smallest of the Seychelles islands, Cousine offers unparalleled privacy and seclusion to its visitors. With only four luxury villas on the entire island, and some of the most stunning views of untouched nature in the world, Cousine Island is a must visit for lovers of uninterrupted natural beauty. As well as being home to beautiful flora and fauna, Cousine Island hosts a variety of native animals, including lizards, turtles and birds. 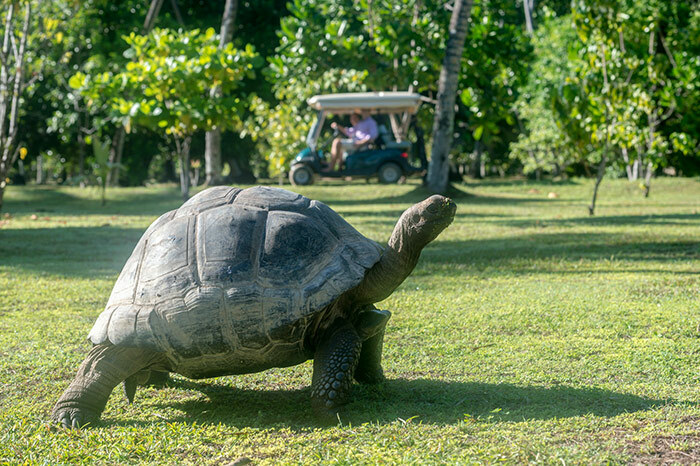 Visitors will be sharing the island with twelve Aldabra giant tortoises, and many extremely rare and exotic Seychelles birds, including the warbler, the blue pigeon and the sunbird. Cousine is one of the most conservation-friendly islands in the world. It is managed by the non-profit Nature Seychelles, and part of the profit from each stay at our Cousine Island villa goes towards conserving the island. Of the 1192 islands that make up the Maldives, Kuda Hithi Island is one of the most beautiful. The island prides itself on being among the most exclusive in the world, reserved only for the lucky few who seek it out and choose to stay. At Coco Privé, visitors can walk across the white sandy beaches and soak in the sun by the azure sea or relax and unwind at the island’s luxurious private spa. Those who are feeling a little more adventurous can observe the island’s exotic colourful sea life while snorkeling, or ride the waves on a surfboard, jet ski or kayak. Much like Cousine, its Seychelles cousin, North Island is gorgeous and secluded with stunning beaches and views of the Indian Ocean. The people on the island are also equally dedicated to conserving the natural environment, which features abundant rare wildlife and plants. The proprietors of North Island are extremely passionate about the wellness of their guests. The island has a spa that takes a holistic approach to rejuvenating the mind, body and soul. Where better to do that than on a private island, far away from the hustle and bustle of the city, and the everyday stress of modern life? A stunning new exclusive-use private island located off the coast of Nosy Ankao. There are fourteen one, two and three bedroom villas decorating the western coast. With wild beaches, incredible diving, fishing, helicopter tours and a world class spa, Miavana brings a new level of luxury adventure to the Indian Ocean. Designed by Silvio Rech and Lesley Carstens, who also designed the award-winning North Island, Seychelles and Leobo Observatory Villa. All aspects of design, construction and the management of the lodge have been created with the environment, local wildlife and regeneration of native plants in mind. Restoring the ecosystem by replanting trees endemic to the island has become an important role for the island. Conserving endemic species of wildlife prevents these rare and exclusive animals from becoming endangered. Community work that the estate has focused on includes building a local school and teaching sustainability. Solar, wind and Biomass energy is used to power the island to achieve an independent renewable resource for the villas’ delicate and isolated environment. Opening to guests this month, Thanda Island is perhaps the most exclusive private island in the world. Ten years in development, Thanda Island will give visitors the chance to swim with whale sharks and watch nesting sea turtles in a private marine reserve. Thanda Island is located off the coast of Tanzania, in a very secluded location giving guests complete privacy in their personal paradise. The island’s sole villa sleeps up to ten guests, plus children, and has dedicated staff, catering to your every need. Excursions to other islands will be available, though Thanda Island should be varied and exciting enough for even the most experienced private island visitor. Our Private Island Collection is the perfect inspiration for a unique and beautiful holiday in the Indian Ocean; the most untouched paradises, fully staffed and featuring plenty of luxury facilities and experiences. We look forward to arranging your island stay, please do get in touch. Art de Vivre hand-pick all the properties in their property rental collections. Our portfolios feature the crème de la crème; the top properties worldwide with unique locations, architecture or experiences. Not all of our collections are displayed online for exclusivity but as the demand for European properties has grown we have introduced 2 new collections - Villas by the Sea and Villas in the Country. We begin the tour of our newly exhibited properties with The Glass House in the Algarve, Portugal. This stunning modern villa was only finished two years ago and as such has been designed with full modern and technological facilities. The villa brings the typical Bauhaus style into the 21st Century with open plan living, high ceilings and inside/outside design. The materials and finishes give the villa a reflective and bright interior with the perfect blend of textures. The hi-tech kitchen and 3D Cinema Suite are the epitome of what The Glass House offers to its guest, the latest and greatest in technology for your enjoyment and comfort. The location itself is extremely unique, set on a beautiful escarpment meadow overlooking the stunning Algarve coastline and pretty village of Praia da Luz. Any collection of European villas would be incomplete without an appearance from the Balearic Islands of Mallorca and Ibiza. Villa Zeus sits in a unique location with the mighty Tramuntana Mountains to the north and a view of the Cape of Cala Llamp, the Mediterranean Sea and their neighbouring Island Ibiza, to the south. The symmetry of the gardens and villa mirror the tranquil surroundings and the interiors with glistening floors and starry LED lights bring the divinity of their name to life. Can Dos Rocas overlooking the sea in Ibiza by contrast features a much more traditional yet minimalist Ibizan design. Glass walls seamlessly merge the expansive living areas and two long sandstone masonry walls complement the geometrically defined outdoor spaces. The interior also is a celebration of natural materials with a fine Tim Page plant fibre carpet and designer furniture crafted by local artisans. On the Greek island of Mykonos lies Villa Karma Pelikanos in an elevated position on the island, enjoying uninterrupted panoramic views of the Aegean Sea. The villa's design combines the old world charm of traditional Greek architecture with 21st century amenities and interiors. Sit outside on the sea-front veranda and enjoy Mediterranean cuisine from local ingredients or head out in the villas’ cars and explore the cultural island of Mykonos. The Cote d’Azur in France is home to the most villas in the collection but finding the latest and greatest in the area has been our focus for the past two years. Domaine Mareeba, in the very heart of Saint-Jean-Cap-Ferrat, enjoys a unique location with a private walkway to the harbour and is only a few minutes walk from a beach club and the village. For those of us who like to traverse the blue waters rather than gaze longingly from its shores, the position near the harbour makes Domaine Mareeba the perfect option. Every aspect of this grand property has been designed to give a light open-plan yet subtle state-of-the-art retreat. One of the most prestigious areas of the French Riviera is the wild town of Saint-Tropez. Debuting in our portfolio are three Saint-Tropez properties which offer entirely different experiences of the famous region. Villa Pearl, near the Gassin area, hides behind a luscious garden with towering greenery and offers a secluded retreat but within reach of the port, restaurants, the parties and clubs. Meanwhile the Glitterati lifestyle of Pampelonne is best experienced at Villa Iris. Sleek white geometric shapes studded with clear glass, Villa Iris stands out as a gem in the most sought-after area of Pampelonne. The famous Club 55 and Pampelonne beach is less than 5 mins walk from this exclusive property. Further south, in the Ramatuelle area of St Tropez is Villa 10, the finest villa on the La Réserve Ramatuelle estate. With access to the facilities of the luxury hotel and its spa, Villa 10 becomes the ideal option for those who need a relaxing retreat from the fun of Saint Tropez. Less than 15 mins drive from Saint Tropez’s best beaches, Villa 10 misses out on none of the action. Back up the coast we reach another town known for it’s glamour, Cannes. Domaine de Provence is a luxury estate that gazes down onto the bay of Cannes, with easy access via helicopter to Monaco. With 17 en-suite bedrooms spread out over three separate villas, the sprawling estate is your own private resort during your stay. The villas’ exteriors may have the classic Provençal stone walls and tiled roofs, but the interiors have traditional elegance to match the glorious lifestyle of the Cote d’Azur. Ideal for a family celebration. As we move along the boot of Italy we come across the finest countryside estates in mainland Europe. Castello di Reschio is a combination of rendered modern architecture and restored traditional rural houses spread across a restored Umbrian estate that dates back to the 11th Century. The estate stretches over 3,000 acres with stables, a hunting reserve, wine cellars, vineyards, olive groves and a creative centre restored from an old Tabaccaia. Tuscany is a natural rural sanctuary and Villa San Luigi’s beautiful gardens and stunning views are the epitome of the Tuscan holiday. Commissioned by the illustrious Chigi family and designed by the renown Sienese architect Baldassare Tommaso Peruzzi (1481 – 1536) the villa has been extended and enhanced over the centuries. Now it stands as an exclusive private home for rental with private infinity pool, modern gym and traditional Italian kitchen. Mas Mateu is a Catalonian 18th Century estate which has retained all the grandeur and style of the period whilst at the same time featuring the most modern of conveniences within its resplendent walls. A graceful arched doorway leads into a series of inviting lounges, with magnificent views over the snow-capped Pyrenees. Mas Mateu features a leading Equestrian centre, private cinema room, sports facilities and dedicated swimming pool complex. The villa is perfect for horse riding fans and those who adore Catalonian culture and cuisine. In 2015 we exhibited the very best Swiss chalets for rental but away from the towering alps, you can have a luxurious stay at La Villa du Lac. A stunning modern villa with understated design and fantastic views of Lake Geneva and the Alps. The villa is a perfect escape from business in Geneva with the relaxation and spa facilities available at La Reserve Geneve hotel. The villa enjoys its own private entrance from the road. Villa du Lac is a well-designed, private and quiet retreat for the busy jetsetter. We trust our new Europe Summer villa collection will give you some inspiration for lazy days under the sun whether you chose at the sea or in the country. We look forward to assisting you so please do get in touch. Looking for a home away from home for your next trip to Geneva? Look no further as last week we visited the most exciting lakeside split-level private villa available to rent short term just 5 minutes from the city. Located in La Réserve Genève, the modern La Villa du Lac, a haven of glass and polished concrete, stood in its garden bordering the lake with an exquisite view of the snowy peaks of Mount Blanc. Subtle luxury - a beautifully simple, uncluttered and stylish villa. Ideal for a couple or small family looking for the ultimate hideaway in Geneva. The villa is 385m² spread over two floors with all rooms facing the lake and gardens. We loved the space of this ideal home with the large glass windows blurring the boundaries between indoor and outdoor. Contemporary decoration and furniture by the Parisian designer Remi Tessier and the owner’s art collection throughout are true delights. The ground floor with ceiling to floor windows houses the generous 160m² open plan living room consisting of a media room, two large sitting areas, a study area and a dining room. The designer eat-in kitchen also leads to a terrace for alfresco dining. Upstairs the master bedroom with bathroom, separate toilet, dressing room, fitness area and south facing balcony. A second bedroom with ensuite shower and balcony. There is a 3rd bedroom which guests could use as a playroom or office. Further personal staff accommodation is also onsite. 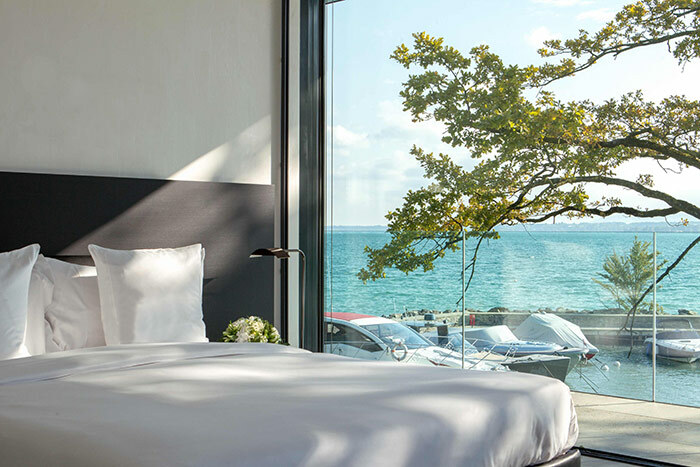 For those who regularly stay in 5* hotel suites in Geneva, the La Villa du Lac offers a refreshing and exciting alternative. Facing south with uninterrupted views of the lake and mountains, the Geneva lake villa offers the ultimate in privacy and tranquillity. Guests will enjoy the acclaimed Swiss hospitality with a personalised housekeeping and concierge service as well as access to the restaurants, pools and 2000m² spa of La Reserve Geneve. The villa is available for short or extended stays, corporate retreats and product launches. In the next few weeks we will be expanding our European villa rental portfolio further to include many new beautiful European villas for rental in Cote d'Azur, Portugal, Spain, Switzerland, Italy and Greece. If you are interested in renting a European luxury villa, please do enquire and we will provide you with a selection of properties for rental for you to choose from.